An illustration from Sidewalk Toronto shows the design for a proposed development of a run-down part of the city's waterfront. The 21st-century battle over privacy may feel virtual and abstract, but in Toronto it has a very real front line: the city’s waterfront. 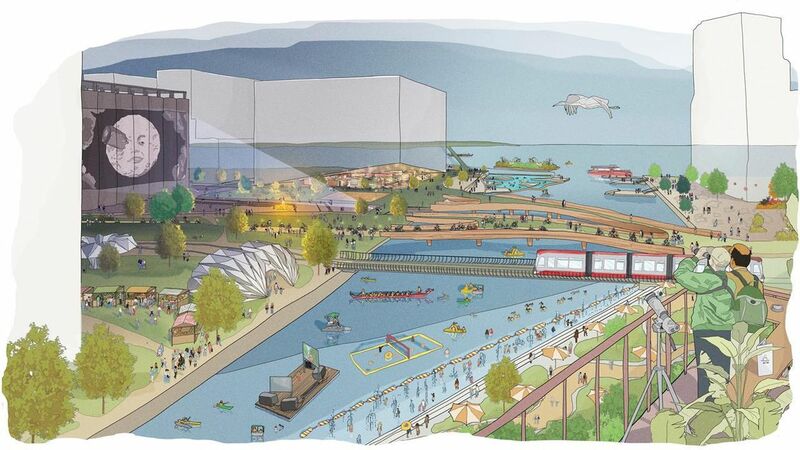 On a disused strip of land on Lake Ontario, tech company Sidewalk Labs proposes creating a city of the future, using arrays of sensors to measure residents' movements and learn how to design streets, buildings and transportation to improve their lives in measurable ways. But who gets to control, access and profit from the data? For months, questions like these have divided Torontonians, the tech industry, the government agency deciding the waterfront’s fate and the experts advising that agency, many of whom have quit in protest over the ethical issues at stake. Now, the government of Ontario Premier Doug Ford is intervening, firing three of the provincially appointed directors to the board deciding the project’s future. Here’s a guide to The Globe and Mail’s coverage of the story so far. Check back here for the latest developments. An illustration of Sidewalk Labs' initial Quayside proposal, including an underground network of utility tunnels. When it was announced in October of 2017, Quayside was touted as North America’s biggest example of the “smart city,” using data to invent a new urban landscape. Sidewalk Labs’s initial proposal for the 12-acre site called for traffic sensors to help move residents more quickly and smoothly and a smart energy grid that would keep power use low. The hope for Quayside was that it would lay the groundwork for a bigger redevelopment of 750 acres of the Port Lands. After a somewhat scaled down follow-up plan was released over the summer of 2018, Sidewalk went to Torontonians with a public presentation of the new plan, promising expansive public spaces, mostly pedestrian-only streets and a system of colour-changing road tiles to assign new uses for the public space. Sidewalk Labs’s site plan, released in November, gave more concrete numbers about the real-estate space it expected to create, most of which would be made with engineered wood, creating buildings up to 30 storeys tall. By Sidewalk Labs’s estimate, the development would create up to 4,000 jobs. But the size of the project has made many government watchdogs and advocacy groups wary of committing so much to one company. In December, a report from Ontario Auditor-General Bonnie Lysyk found Waterfront Toronto gave Sidewalk preferential treatment in selecting it as its partner for the smart city. She revealed internal e-mails and letters showing that, well in advance of a formal request for proposals (RFP) being issued, Sidewalk appeared to be getting more information from Waterfront Toronto than potential competitors for the bid. Ms. Lyszyk said this raised “the risk of an unfair and unequal advantage to all parties that would be responding to the RFP,” and urged more government study of the project. Sidewalk Labs: A New York-based research firm owned by Google’s parent company Alphabet Inc., Sidewalk Labs describes its mission as “reimagining cities to improve quality of life.” Its CEO is Daniel Doctoroff, a former New York deputy mayor and one of the leaders of the city’s post Sept. 11, 2001 redevelopment. Waterfront Toronto: A government agency created in 2001 by the governments of Canada, Ontario and Toronto to revitalize the city’s disused waterfront lands. The province usually has four members on the board; one of them quit over the summer, and the Progressive Conservative government fired three of the others – all appointees of Mr. Ford’s Liberal predecessor, Kathleen Wynne – potentially reshaping the role and agenda of the agency. The municipal and federal governments have come out in support of Waterfront Toronto’s leadership. Toronto Mayor John Tory stepped in to save Waterfront Toronto’s board from losing yet another member, Stephen Diamond, in December, shortly after the Ontario government fired its three appointees over concerns about the agency’s proposed development. Mr. Diamond, president and chief executive of developer DiamondCorp, planned on resigning at the end of 2018, but he received a phone call from Mr. Tory trying to persuade him to stay until the end of his term in March. Sidewalk Toronto: This is the project name for the collaboration between Sidewalk Labs and Waterfront Toronto to design and build the Quayside project. Digital Strategy Advisory Board: A group created by Waterfront Toronto to study who should control and access the Quayside data. The panel includes tech-company founders and professors of information and privacy law, led by interim chair Michael Geist of the University of Ottawa. The board has seen several high-profile departures from experts who accused Sidewalk of heavy-handed tactics to push the project through. These include entrepreneur Saadia Muzaffar and venture capitalist John Ruffolo. The Sidewalk panel: Last October, Sidewalk Labs announced it would form its own separate panel of private-sector, non-profit and academic leaders to offer advice on Quayside. Jim Balsillie: The former co-CEO of Research in Motion (now BlackBerry) disapproves of the Sidewalk project. In a Globe and Mail opinion piece, he called it “a colonizing experiment in surveillance capitalism attempting to bulldoze important urban, civic and political issues.” Waterfront Toronto has sought his advice about Sidewalk, though he is not officially part of its Digital Strategy Advisory Panel. Cybersecurity expert Ann Cavoukian speaks at an event at the Globe and Mail Centre on Nov. 8. What data is collected: For some advocates, privacy isn’t something that can wait until after surveillance data already been gathered: If people’s data must be used at all, the sensors should anonymize the data at its source. That’s one of the core principles of the “Privacy by Design” philosophy devised in the 1990s by Ann Cavoukian, a former Ontario privacy commissioner. Some of Quayside’s infrastructure such as sensors to count pedestrians on streets or measure air quality, wouldn’t collect identifying information. But Ms. Cavoukian, who until last October was a paid consultant for the Quayside project, wanted assurances from Sidewalk that Privacy by Design principles would be built in from the outset to stop unnecessary gathering of identifying information. Ms. Cavoukian eventually quit her consultant role in protest, saying Sidewalk wouldn’t guarantee that third parties involved in Quayside would have to adhere to her framework. Ms. Lysyk, the provincial Auditor-General, also raised concerns about the data collection in her December report, warning that if government shared concerns about what data was collected, Waterfront Toronto would have limited and indirect power to act on those concerns. Who can access it: Sidewalk has proposed to put Quayside’s data in the hands of an independent trust, which would be responsible for stripping identifying information and making it available to everyone. The proposal didn’t reassure all the critics of the Quayside project: Open-data advocate Bianca Wylie, for instance, questioned why a vendor should be leading and framing the creation of such a trust. The Auditor-General’s report also questioned why there weren’t more specifics about how the data governance plan would work. Where it will be stored: Geography plays a big role in data-privacy debates, since if data is stored on servers outside Canada, it gives foreign law-enforcement or government agencies more opportunities to access it. Sidewalk’s proposal says the data wouldn’t necessarily be stored in this country. There is nothing in Ontario law that would require the company to store the data locally. The privacy debate has pushed the timetable for Quayside further into 2019, and that’s just the proposal stage: If Sidewalk’s final plan is accepted, it’s unclear how much longer it would take to build the development. Sidewalk has already held four of five planned roundtables to gather feedback about Quayside, and hopes to submit its updated plan to all three levels of government for review in January. Then it’s up to Alphabet Inc. and Waterfront Toronto’s board of directors to consider the plan. An illuminated Google logo is seen inside an office building in Zurich. In May, 2018, sweeping new digital privacy laws took effect in the European Union that affect how the search engine and other companies can use people's data. For the merchants of social media and Big Data, 2018 was a very bad year. First came the Cambridge Analytica scandal, when millions of Facebook users learned their data had been illicitly harvested by a British research firm for political purposes; then then the European Union rolled out sweeping and strict new data-privacy laws; then a Wall Street Journal investigation revealed data-security flaws in the Google+ social network that Google didn’t publicly disclose for months; then Facebook revealed the biggest breach in its history, the theft of hacked data from as many as 30 million users. Fearful of more regulatory scrutiny, Silicon Valley has been in non-stop damage control mode, overhauling terms of service and cracking down on how third parties can use the data their products collect. On Oct. 24, Google rolled out videos and user guides to show how its search engine and tools monitor users' online habits. Google says it eventually plans to expand privacy features to other products, like mapping applications. This is the context in which Waterfront Toronto, and Canadians generally, must decide the Quayside project’s fate. Editor’s note: Julie Di Lorenzo was not a member of Waterfront Toronto's Digital Strategy Advisory Panel. This story has been corrected. Editor’s note: Sidewalk Toronto is the project name for the planning exercise between Sidewalk Labs and Waterfront Toronto, and not a joint venture in the legal sense.